Porcelain veneers are an extremely popular cosmetic dentistry procedure, and with good reason. They provide a more conservative option than dental crowns when it comes to covering cracks, chips, stains, and other problems that might make you less than happy about your smile. 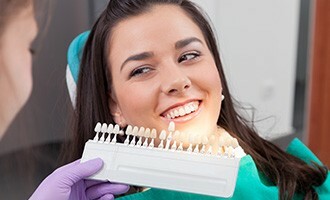 South Shore Dental Care can provide you with a number of options for porcelain veneers so that when you come to our Massapequa dental office, you can find the one that’s perfect for you. We work with the prestigious Jason Kim Dental Labs for the crafting of our porcelain veneers. As a master ceramist, Jason J. Kim believes that crafting your porcelain veneers should be a team effort. This makes for a more natural-looking and aesthetically complete smile. Our practice is also equipped with a CEREC unit which can create porcelain onlays for you in just a single one-hour visit. Contact us today to discuss all of your options for porcelain veneers with our cosmetic dentists, Drs. Dory and Khalida Stutman, at South Shore Dental Care.